Bungalow with marvelous panoramic sea views, a part of the Residence Los Olivos, situated in the most quiet and calm corner of the luxurious area – Altea Hills. Comfortable, nicely furnished bungalow has 3 floors and suits for 8 persons. - kitchen with all necessary equipment and utensils (inc. dishwasher). High speed fiber WiFi internet is available (for free). All rooms are air-conditioned, infrared heaters in the bathrooms, room heaters are available upon request. All windows have blinds. Free private parking on site. Baby cods and highchairs are available upon request for extra charge. Closed territory, outdoor pool with natural grass surrounding area, garden and quiet corners with mountain and sea views. Perfect for family vacation. - electricity surcharge is applied when the consumption exceeds 15 kW/day (happens in case of wasteful use of air conditioning). The Altea Hills Urbanization is located in Altea – Alicante, opposite the Mediterranean Sea and with the Sierra Bernia at its back, in what can be considered a privileged environment at the most authentic Mediterranean style. Gifted with the mild climate of the area, Altea Hills is proud to be considered one of the most exclusive residential areas of the whole Mediterranean, on the level of excellence in its facilities maintenance, efficiency and control of the Private Security Service 24 hours 365 days per year and the competence and professionalism of its employees. 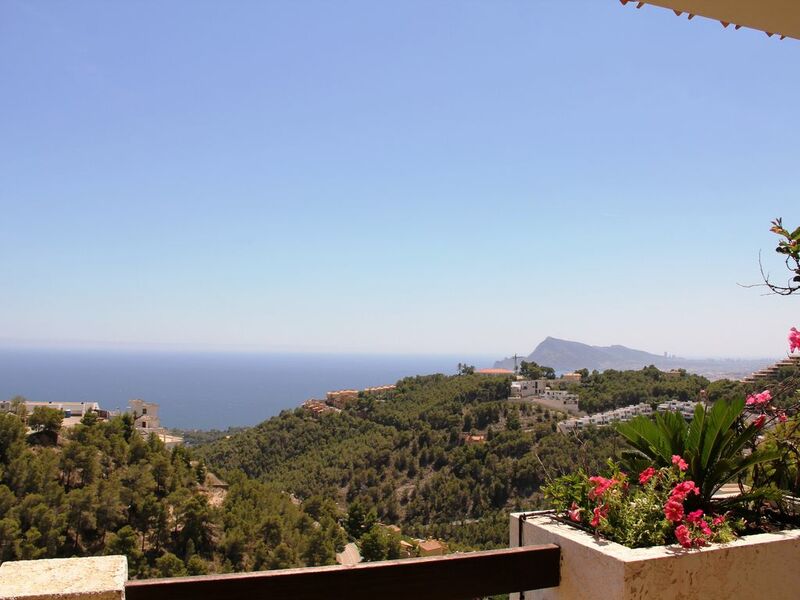 The views from Altea Hills on the Altea Bay and on the Marina Baixa mountains are a real sight, leaving mark in the retinas and in the memory of those privileged who can enjoy them. Space heaters available upon request. Two sofas for 5 people. Flat screen TV. All necessary stuff is provided. Tenis club is on basic urbanization site. Paid. Attention! Electricity surcharge is applied if a limit of 15 kWt/day will be exceeded. Over limit electricity charge: 0.30€/kWt.